Facebook has made marketing and creating ads incredibly easy. Facebook’s internal marketing and ad set creation is something that every business and organization should look at using because there are many benefits from advertising on social media. 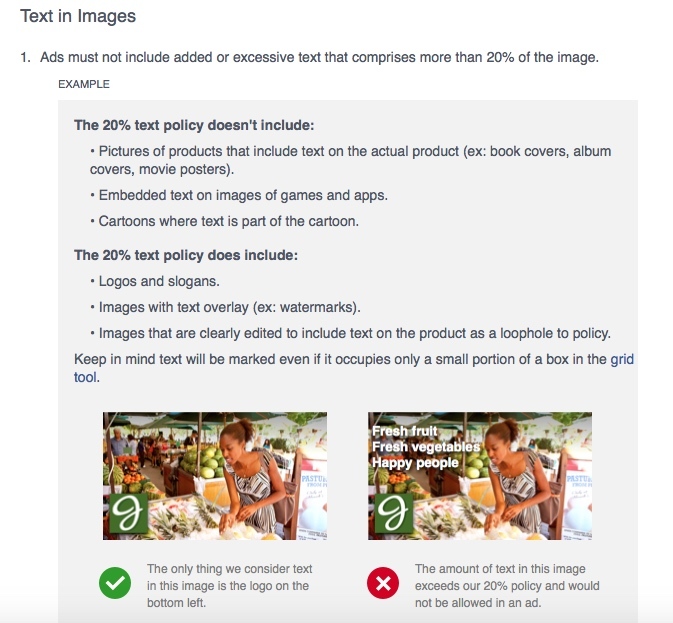 However, there have been many days when I have created an ad set for Facebook only to have my ad rejected because my images did not pass the 20% Text Rule. 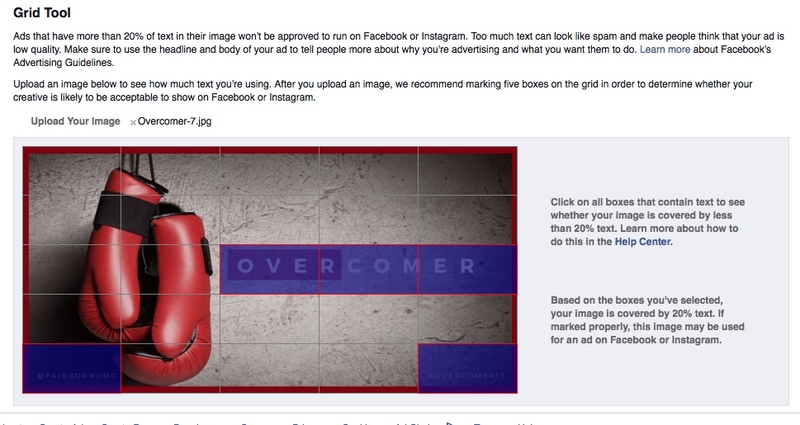 In order to have an approved ad set through Facebook they require that your images have no more than 20% text. Facebook does this to ensure that people see high quality ads and images. When creating the ad or image it is often hard to tell by simply looking at the image, whether or not the text takes up 10% or 60%. I went in search of an answer and a way to test my image before spending all the time to create an ad set that will ultimately get rejected. I found many websites that gave me parameters, but nothing that actually allowed me to put my image into the grid or pre-made form. 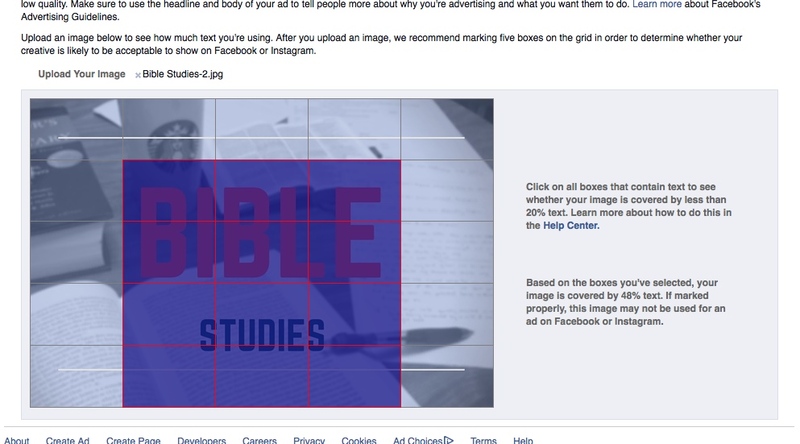 Then I found that Facebook has already created a grid – imagine that. So I clicked on the link and this is the page that comes up. To Upload an Image – Click the Choose File button to upload a photo. Once the picture is uploaded you can then click on the boxes inside the grid that have text in them. The Image I selected has at least 40% Text and more than likely would be rejected for a paid ad on Facebook. If I wanted to keep this image I would have to alter the text to fit inside the 20%. Image 3, in comparison to Image 2 has 20% text, and you can tell by just looking at Image 3 that there is significantly less text covering the whole image. Here is another image that Facebook actually posts on their site for an example. The whole process was very easy and gave me a good idea as to what images would be approved and not approved according to Facebook’s Ad Policies. What tools have you used that help with the 20% Text Policy? I would love to hear your thoughts.